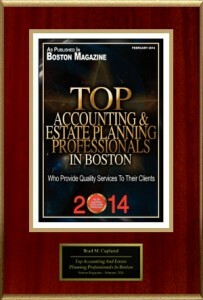 Brad M. Capland, CPA, P.C. is a certified public accountant and business advisor with more than 25 years of practical experience. Brad specializes in helping small to medium-sized privately owned businesses become more profitable and run more efficiently. He is a member of both the American Institute of Certified Public Accountants and the Massachusetts Society of CPAs. Preparation of financial statements, accounting and analysis, business advice and bookkeeping. Tax return preparation, tax planning and tax audits. Consulting, advice, planning, analysis and evaluation. Assisted living planning, long-term care insurance, and investment monitoring. Brad would be a good person for you to meet. He has the skill set and temperament to do the kind of work that our company is doing. In particular, he is able to get into a business and identify the accounting questions. He is a good accountant with the hands-on skills needed to deal with small to medium sized businesses. He is comfortable in new situations. He is persistent without being abrasive. He was able to take on project work – i.e. schedule out a week to do a due diligence job and to take on recurring assignments – i.e. be the part-time controller of a recently acquired entity and spend a couple of days each month closing the books and reviewing the progress on the transition. 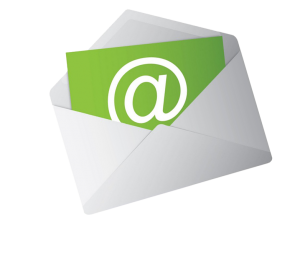 Join my monthly newsletter for free small business tax and accounting tips! 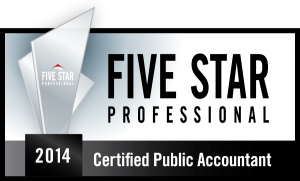 Thank you to my clients and peers who recommended me for the 2014 Five Star award. I was recently chosen and am honored to receive this prestigious client satisfaction award for 2014! I was published in the February 2014 issue of Boston Magazine!